MacKenzie Street - TERRACULTURE ." 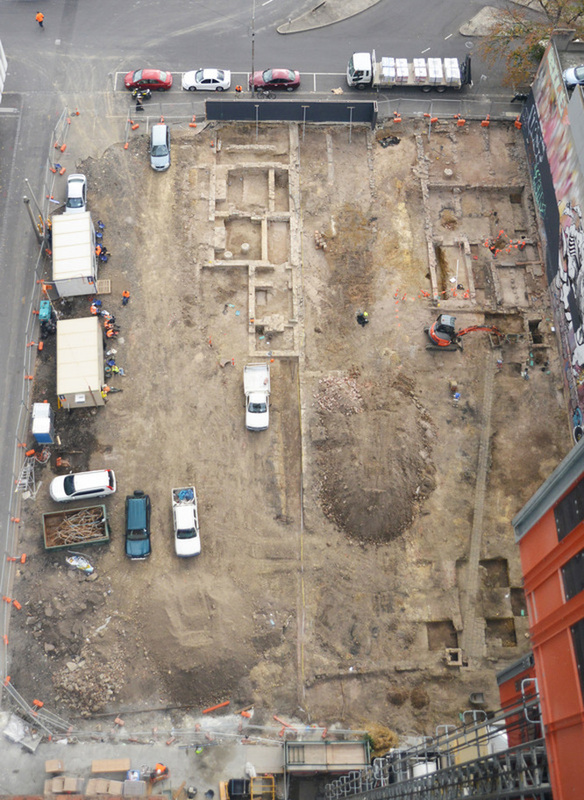 In 2016, Terraculture undertook major archaeological excavations at Mackenzie Street located in Melbourne’s CBD. Malayasian company UEM Sunrise was to develop a 38 storey apartment building on the site which had been an asphalt car park since the early 20th century. TerraCulture provided a Desk top Assessment that unveiled an extensive site history with potential sub surface remains of two 1880s residential homes, a slate yard and the former Mistletoe Hotel built in 1855 with adjoining livery stables. Under conditions of the consent issued by Heritage Victoria, TerraCulture carried out extensive archaeological excavations that revealed significant subsurface remains of the Mistletoe Hotel providing a vibrant insight into a hotel operating during Melbourne’s gold rush era. The project team included a number of professional archaeologists and conservators while involving students from La Trobe and Monash Universities as well as the general public. Heritage Victoria declared this excavation one of the most significant archaeological digs in Victoria’s history with the site yielding up to 250,000 artefacts. The project generated extensive media and public interest.